Selection Sunday is just over a month away, but the top-16 seeds released on Saturday by the NCAA selection committee still have plenty to work on before the big dance begins. Below are the title odds for each of the top teams and the glaring weaknesses bettors should be aware of before placing a futures bet. Selection Sunday is just over a month away, but the top-16 seeds released on Saturday by the NCAA selection committee still have plenty to work on before the big dance begins. Below are the title odds for each of the top teams and the glaring weaknesses bettors should be aware of before placing a futures bet. 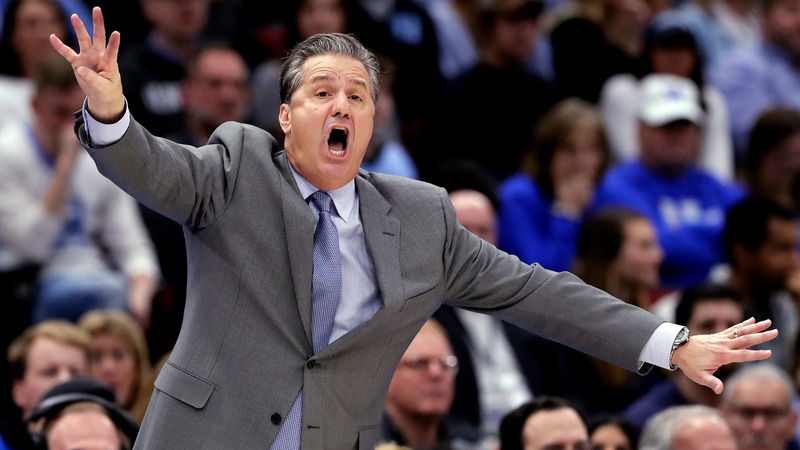 ## NCAA Tournament 2019 top-16 seeds, odds to win title NCAA selection committee reveal on Feb. 9; Odds provided by Westgate __East (Washington, D.C.):__ (1) Duke -- +180 odds, (2) Michigan -- 14/1, (3) Marquette -- 60/1, (4) Iowa State -- 40/1 __South (Louisville):__ (1) Tennessee -- 10/1, (2) North Carolina -- 12/1, (3) Purdue -- 25/1, (4) Nevada -- 30/1 __Midwest (Kansas City):__ (1) Virginia -- 8/1, (2) Kentucky -- 8/1, (3) Houston -- 80/1, (4) Wisconsin -- 80/1 __West (Anaheim):__ (1) Gonzaga -- 6/1, (2) Michigan State -- 8/1, (3) Kansas -- 30/1, (4) Louisville -- 100/1 __Play and win:__ [Join our free contests](https://betchicago.chalkline.com/) ## Weaknesses for each NCAA Tournament 2019 top-16 seeds __Duke (+180 odds):__ The talent is clearly there, but the experience (7th youngest in NCAA) is not. Duke's 3-point shooting was a major issue ahead of [Saturday's game at Virginia](https://www.betchicago.com/saturday-college-basketball-betting-recap-michigan-revenge-wisconsin), with the Blue Devils shooting 29 percent from in ACC play. Duke went 13-of-21 from beyond the arc on Saturday, however. __Tennessee (10/1):__ The Vols' 7-man rotation has enjoyed the easiest SEC schedule to date, per KenPom [and won't face a](https://kenpom.com/) top-25 KenPom team on the road in conference play until Feb. 16 at Kentucky. The Vols are fortunate that opposing teams are shooting just 61.3 percent from the free-throw line against them this season. __Virginia (8/1):__ Can't win big games. Two losses to Duke already this season and have lost in the opening two rounds of the NCAA Tournament the past two years. __MORE:__ [Games of the Year point spreads](https://www.betchicago.com/vegas-sportsbook-odds-upcoming-college-basketball-rivalry-games-duke-unc) __Gonzaga (6/1):__ Killian Tillie will miss the rest of the regular season with a foot injury but the Bulldogs will still easily win the WAC title. Gonzaga struggled at times in non-conference play defending the 3-pointer, but they were also not at full-strength due to injuries. __Michigan (14/1):__ The Wolverines' offensive efficiency has gotten worse as the season rolls along. They really only play six guys and are poor on the offensive glass (ranked 252nd) and getting to the free-throw line (277th), where they shoot 68.7 percent as a team this season. __North Carolina (12/1):__ Lack of focus nearly cost the Tar Heels another home loss Saturday vs. Miami. Point guard Coby White is a true freshman that is turning the ball over at an alarming 20.6-percent rate (per 100 poss.) in ACC play. Shooting guard Kenny Williams owns a turnover rate of 21.2 percent (per 100 poss. ), per KenPom. __Kentucky (8/1):__ The Wildcats' defensive efficiency has improved in SEC play but its offense has regressed slightly, ranking fourth behind Tennessee, Auburn and LSU. Kentucky ranks last in the SEC in 3PA/FGA and has one of the youngest rosters in the country. Sophomores PJ Washington and Nick Richards are the only players with NCAA Tournament experience on the roster. __[Michigan State (8/1):](https://www.betchicago.com/michigan-states-ncaa-tournament-odds-2019-losing-streak)__ Lack of guard depth puts even more pressure on PG Cassius Winston, who has struggled vs. pressure defenses, turning the ball over at a 19-percent rate (per 100 poss.) in Big Ten play. Down low, when Nick Ward is held to 14 points or less, the Spartans have lost every game this season. __Marquette (60/1):__ The Golden Eagles will go as far as guard Markus Howard takes them. The 5-11 junior is averaging 25.2 points per game and dropped 38 in Saturday's win over Villanova. Marquette ranks 12th nationally in 3-point shooting and is 10th in free-throw percentage but struggles on the offensive glass and ranks 215th nationally in turnover percentage. __Purdue (25/1):__ The Boilermakers are one of four NCAA Tournament teams (Virginia Tech, Auburn, Villanova) that truly lives and dies by the 3-pointer. Purdue relies on the shot for over 40 percent of its points, but ranks 285th in defending the shot. Carsen Edwards is a Big Ten Player of the Year candidate but is shooting just 33 percent from deep in conference play. __Houston (80/1):__ The Cougars are 22-1 entering Sunday's game vs. Cincinatti and have one of the best defenses in the country. But Houston's strength of schedule ranks 201st nationally and it has faced just one top-25 KenPom offense this season (LSU). In that home game, the Cougars trailed by 15 in the second half before mounting a comeback win. LSU remains the Cougars' best win of the season to date. __Kansas (30/1):__ The Jayhawks are in a bit of turmoil, knowing it will be without Udoka Azubuike, Lagerald Vick and five-star recruit Silvio De Sousa. Kansas' best defender Marcus Garrett is dealing with an ankle injury at the moment and Bill Self desperately needs him back to help a team that ranks second-to-last in the Big 12 in defending 3-point shots. Kansas is also turning the ball over on nearly one out of every five possessions (20.2%) and is shooting just 67 percent from the free-throw line. __Iowa State (40/1):__ Like 2017 when they fell in the second round of the Tournament, the Cyclones struggle on the glass, ranking 185th in offensive rebounding percentage (28.1% per 100 poss.) and 174th in allowing offensive rebounds (28%). Those rates have dropped to a dismal 24.5 percent and 31.1 percent rate, respectively, in conference play. Allowing second-chance points and losing the rebounding battle led to Iowa State losing to TCU on Saturday at home. Those rebounding rates could get even worse, considering Iowa State, which ranks 337th in bench minutes, has enjoyed the easiest Big 12 schedule thus far, according to KenPom. __Nevada (30/1):__ Dating back to last year's Tournament, the Wolf Pack have a dangerous tendency to start slow in games. Nevada lacks a true point guard and ranks 177th in 3-point shooting percentage (34.3). Nevada has the experience and talent but its best win this season according to KenPom was at home vs. No. 43 Utah State. __Wisconsin (80/1):__ No team in the Big Ten relies on a single player more than Wisconsin does with Ethan Happ, who is being used on 36 percent of possessions. As Happ goes, so do the Badgers but the 6-10 senior has a glaring weakness teams can take advantage of: Free-throw shooting. Happ is shooting 38 percent from the charity stripe in conference play and the Badgers shoot just 65.7 percent overall (ranked 316th). Wisconsin also ranks 319th in offensive rebounding rate and is 265th nationally in forcing turnovers. __Louisville (100/1):__ The Cardinals are second-to-last in FTA/FGA in ACC play, indicating a pressure defense which has the tendency to commit fouls. Louisville has committed 15 or more fouls its last five games, yet are dead last in steal percentage overall in ACC play. The Cardinals haven't reached the second weekend of the NCAA Tournament since 2014-15.